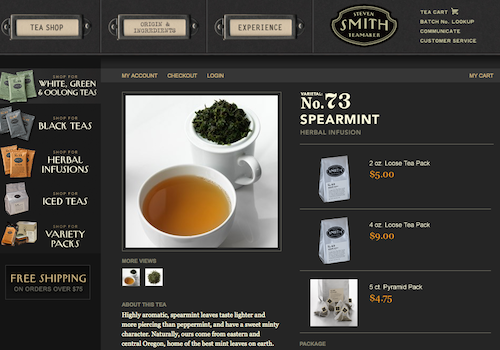 If you aren't in the Portland area or visiting anytime soon you can buy Steven Smith Tea online here. Sure, peppermint takes the cake in Oregon, but spearmint is a close second in terms of in-state cultivation. Two main differences between the mints are that peppermint plants are taller with bigger leaves, and peppermint has a stronger flavor and aroma than the sweeter, lighter tasting and smelling spearmint. Steven Smith of Steven Smith Teamaker, a boutique tea company specializing in full leaf, small batch tea with a retail shop on Northwest Thurman, has been working with the same local spearmint growers since the mid-1970s -- Don, Monty and Marvin Mills of Mills Mint Farm in Stanfield, Oregon in Northeastern Oregon. The Mills family was amongst the first in Oregon to cultivate spearmint and peppermint. In the mid-70s Smith was a co-owner of Stash Tea before it was sold in 1993 to Yamamotoyama in Japan. At that time Smith and the other Stash owners and employees purchased field run mint (unprocessed mint directly from the farm) from the Mills family and cleaned it in what is now !Oba! Restaurante but which was then Stash Tea headquarters. They used the mint for their tea and also sold mint to Lipton Tea and Celestial Seasonings. After selling Stash in the early 1990s Smith started Tazo Tea in his home kitchen which he sold to Starbucks in 1999 and continued to work for until 2006. In late 2009, Smith opened his newest tea endeavor -- Steven Smith Teamaker -- in the brick building next to the former Carlyle Restaurant on Northwest Thurman Street. All of Smith’s spearmint to this day comes from Mills Mint Farm which cultivates 400 acres of spearmint annually with minimal inputs thanks to regular crop rotation (corn, wheat and peas) and intensive hand weeding. If you’d like to try Mills’ local leaves they are blended in Smith’s Fez tea -- a combination of Mao Feng China green tea, Oregon spearmint and Australian lemon myrtle leaves. Who can argue with that?